Are you interested in swimming, but just hate trekking off to the public pools that are full of chlorine, too cold and too crowded? Wouldn't it be great to have your very own pool only steps away? In it you could do swim training, lounge around with friends and neighbors or have endless hours of family fun? Everyone dreams of having a swimming pool in their own backyard, but often it is not possible because of the size of a regular pool and maintenance costs. An Endless Pool Swim Spa is the perfect answer to backyard exercise and recreation. An Endless Pool Swim Spa offers you everything that you get from a regular size pool (and more), all in a size that will fit in almost any backyard and with maintenance costs that are much lower. 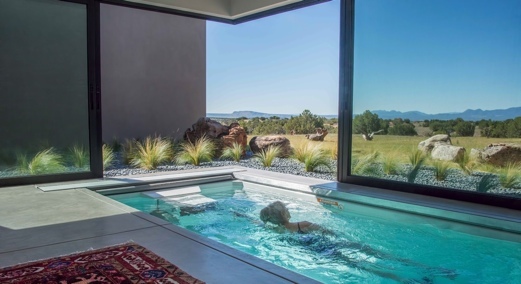 An Endless Pool can be installed virtually anywhere, indoors or out for year-round enjoyment. The small footprint (17 feet by 7 feet 7 inches) allows it to fit in virtually any backyard. And it comes pre-plumbed and pre-wired so installation is a snap. Just position the swim spa in place, fill it with water, connect up the electricity and you are ready to swim! An Endless Pool is a fraction of the size of a standard pool, making it a lot less expensive to maintain. The swim spas are little bigger than a large hot tub, thereby using less water, harmful chlorine and electricity to heat. Regular maintenance takes only a few minutes a week. But at the same time, they give you all the enjoyment you would normally get from a full size pool. In an Endless Pool Swim Spa you can enjoy swimming, aquatic fitness, therapy and family fund -- all in the privacy of your own home. The Endless Pool swim spa combines the luxury of a swim spa the swim current of an Endless Pool. The result is backyard living at its finest. 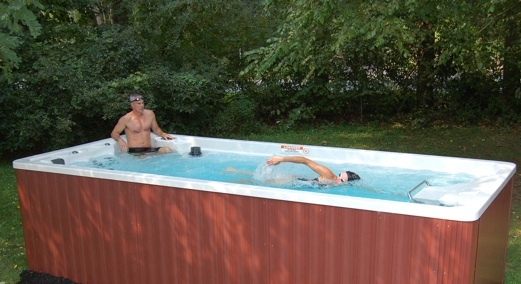 The quality of the swim current makes an Endless Pool Swim Spa different from other swim spas. For more than 20 years, Endless Pools has focused on providing the best current in the market. Only recently (the last 5 years) have they made this, the highest quality swim current, available in a swim spa. The unique current system of the endless pool allows you to swim forever without flip turns. 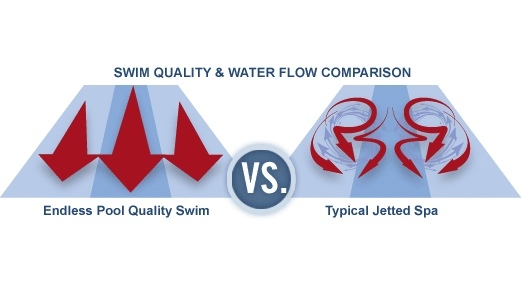 This current can be set anywhere from a gentle breaststroke to a competitive racing freestyle. And if you start to feel tired, just simply turn down the current or step out of the current for a rest. You can even adjust the water temperature so that it is just right for you. With an endless pool you really will have no excuse to not keep fit and healthy. The convenience of a pool in your own home makes it so easy for you to keep up a healthy exercise lifestyle.